I want to talk to y’all about something that deeply irks me. This irk may be justified in your eyes, or perhaps you’ll think I’m being crazy and illogical and want to unfriend me immediately. A couple days ago, Jessie and I went to McDonald’s for breakfast. Here’s a fun fact: I like McDonald’s breakfast. A lot. I am kinda sorta obsessed with their McMuffins. I kinda sorta wish I could eat 80 of them for breakfast every day because they’re SOFREAKINGGOOD but obviously I can’t, simply because I don’t have $80 to spend on McMuffins. I prefer to spend my money on stuff like this. Anywho, Jessie and I were there and I resisted 79 of the McMuffins and then got a blueberry oatmeal (side note: while this sounds like a sponsored post, it is not, my friends. I just freaking love Mickey D’s and their new blueberry oatmeal is good). Jessie and I sat down at a middle table flanked by two tables, each of which had trays of trash abandoned on them (other side note: again, people, McDonald’s isn’t inferior to you. Throw your trash away, forreal). Both trays–which I admired while waiting for our number to be called–were full of crumpled wrappers, abandoned cups and containers and things, all trash and nothing worth staring at like I was doing for no particular reason. All of a sudden, this weird pregnant woman who had been pacing around the restaurant for awhile now, half-assedly paying attention to her toddler roaming about, approached the table to our left, pushed away a couple of balled-up wrappers, and grabbed a sealed packet of syrup. I mean, yeah, the packet of syrup was sealed and all, but it was buried under some stranger’s trash. And I know it was a stranger’s trash because the woman came in after the trash appeared, and she had her own table with her own food & trash in a far corner. She rummaged through a stranger’s tray of trash. What if like, that stranger had used a hypodermic needle or something after eating their pancake breakfast and decided to dispose of their syringe on that tray, buried unsuspecting-like under some wrappers, and this crazed pregnant woman rummaged through and got poked?! Or what if that stranger had a couple of rugrats running around with some kid disease and they licked the packet and got it all germy-like?? Really, the disgusting possibilities are endless. The worst part of this whole debacle? Jessie thought it was totally fine. “It was a sealed package,” he said. “There were no germs on it. It’s not that weird,” he assured me, thus making me seem like some high-fallutin’, pinky-raised snot who refuses to pilfer through GARBAGE on someone’s abandoned tray. So basically, my own boyfriend insulted me in a McDonald’s for thinking it was weird for someone to grab something off someone’s garbage tray. I mean, if we’re playing devil’s advocate here, this situation really is not any different from say, thrifting clothes. I’m a big fan of the consignment shops around town that sell gently-used, carefully selected, fashion-forward items–like Betsey Johnson vintage tunics for $30. Really, even though there are supposed “fashion buyers” purchasing only the chicest, trendiest clothes to sell in the stores, you still have to dig from tasteless, ugly, smelly crap to find gems sometimes. So in a way, I’m being a hypocrite. I will dig through carefully-selected garbage on racks, but not through McDonald’s trash. I mean, there could have been like, smelly socks once sitting on my Betsey tunic or something–perhaps dirty underwear or the equivalent of something as gross as cold, soggy, food wrappers–but I dunno, there’s just something disconcerting about going through pure trash to get a syrup packet. Sure, it’s wasteful to toss it, and I fully believe the original eaters should have left the syrup out of this, on the table, for someone else to use without digging for it like a rabid animal for food, but omigawd, just ask for a new packet pleaseandthankyou. I can’t even share ice cream with Jessie, the absolute love of my life. How am I supposed to eat syrup from some stranger?! What about those possible hypodermic needles laying in wait?! UGH, so many dangers, people!! Anyway, after being defeated from my boyfriend, I came home and made some pies. I don’t know if you know this, but McDonald’s just introduced S’Mores Pies… like their apple pies, but filled with gooey marshmallow filling and creamy chocolate. Um, yum. But of course, I had to change things up a bit. Domestic Rebellify it, you know. Make it my own and not uh, someone else’s pilfered treasure or anything. 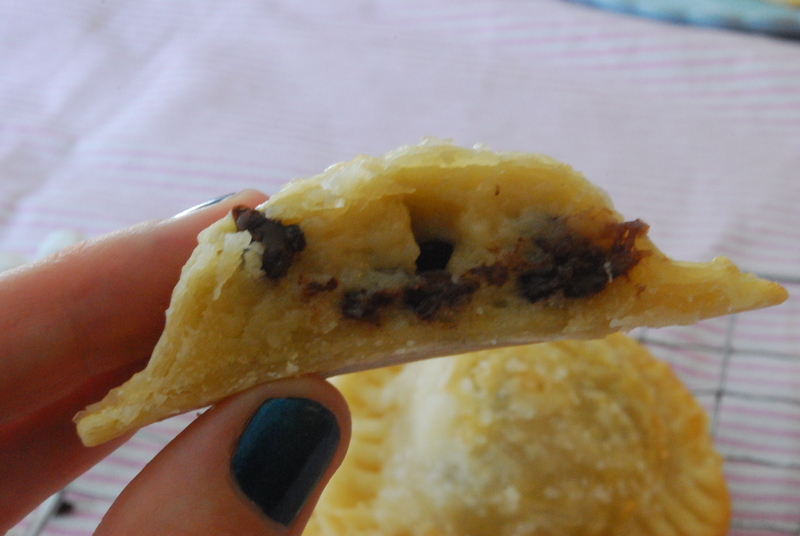 So I made some Nutella S’Mores Hand Pies, but I also wanted a creative way to use up some of my leftover chocolate chip cookie dough. What, you don’t have back-up eggless cookie dough in your freezer for random pie-making times like this?! Weird. So for good measure, I shoved some chocolate chip cookie dough in pie dough as well. You know, because I can. The result is pretty freaking awesome… but you’ll have to try it yourself. Plus, they kinda look like ravioli. And ravioli totally rocks. 1. Preheat oven to 425 degrees F. Line a rimmed baking sheet with foil and mist lightly with cooking spray. 2. Roll out each dough circle onto a flat, clean surface. Using a drinking glass, cut circles of dough out and set them aside. Re-roll dough and recut, if needed. You should have an even amount of dough circles for tops and bottoms of the pies. 1. Spread a small 1/2 tsp-1 tsp of Nutella in the center of a dough circle. Top with 4-5 mini marshmallows. 2. Place a second dough circle on top of the first filled crust and gently press the edges together to seal. Crimp with a fork, if desired. 3. Place on the baking sheet, brush lightly with egg, sprinkle with sugar, and bake for approx. 8-10 minutes or until golden browned. 1. Prepare the cookie dough, roll into Tablespoon-sized balls, and freeze until solid (preferably overnight). 2. Place one dough ball in the center of a dough circle; top with a second dough circle; crimp with a fork, if desired. We have our s’mores fans in this house, and we have our cookie dough fans, so both these pies pleased our family and their preferences. 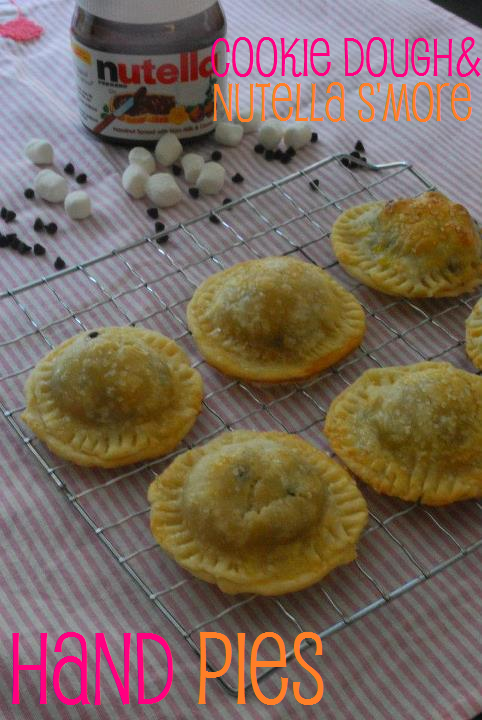 The marshmallows will disappear in your hand-pies (magic!!) but the flavor will remain. If you’d like them gooier, feel free to sub in a small dollop of marshmallow cream instead of the marshmallows. Also, think of switching up the cookie dough flavors in the pies–peanut butter, oatmeal, sugar–the possibilities are endless! 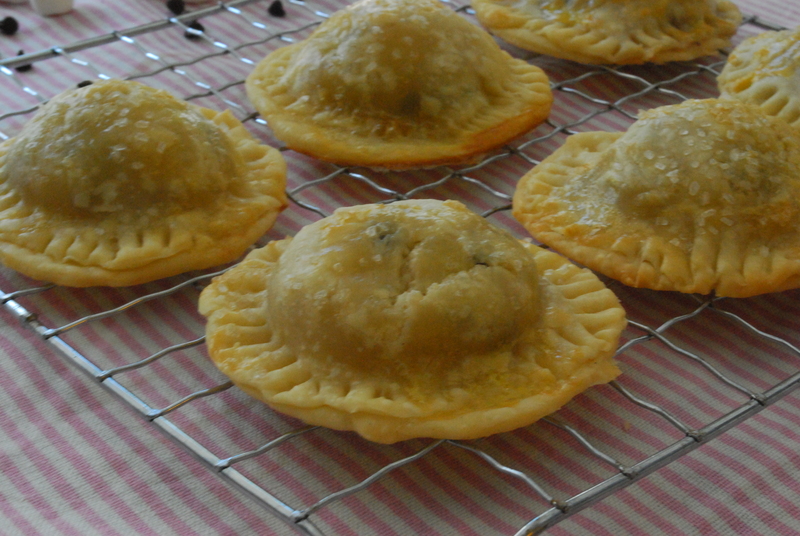 Hayley, my new FB friend, I honestly have hand pies on my to-bake list! I’m hoping ot make s’more handpies. 🙂 Using premade pie dough because obviously I can’t deal with making my own! I had NO IDEA McDonald’s made s’more hand pies?!?!?! You may not believe me but I’ve NEVER had an egg mcmuffin before. Am I american?! Hahaha yes, you ARE American and honestly, they’re good but not THAT amazing that I’m like OMGYOUMUSTTRYITNOW, but as a fast, easy breakfast, they’re pretty good 🙂 and yes, you gotta make hand pies! They rock and are dangerously easy to eat more than five. So, I am all about reusing and recycling, but even I draw the line and digging through someone else’s McDonald’s TRASH. Gross. 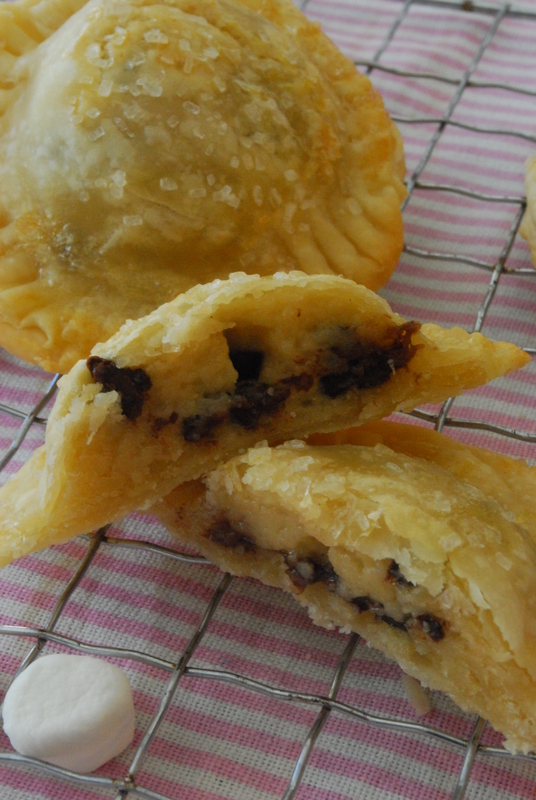 And I LOVE handpies–I have some ideas I’ve actually been mulling over, but with cookie dough!?!? Oh, yes, PLEASE! Hahaha glad I could get some backup here! Yes, it was weird. 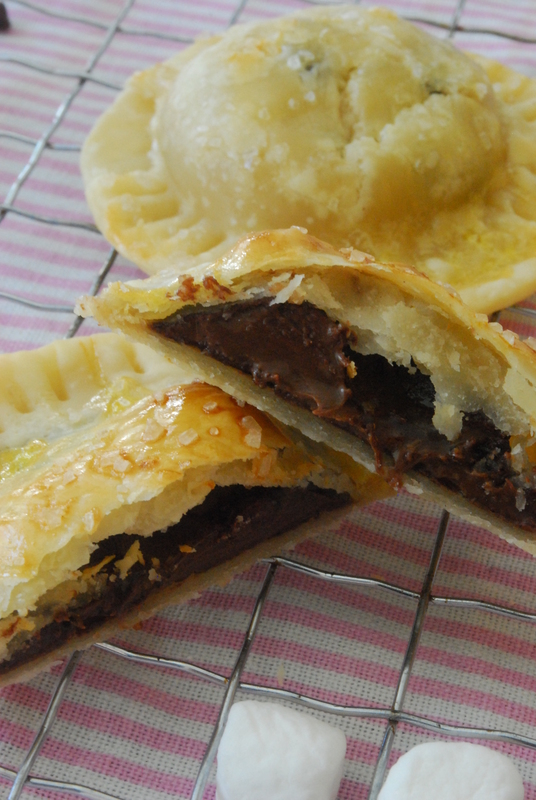 At least I got handpie inspiration from it, lol. Ewww. I am with you on this one, that’s totally gross. I don’t care if it was sealed. But I am a germaphobe. I actually never shop in thrift stores for the same reason. I always imagine the worst/grossest possibility of where all those things have been. I have a problem, I know. Don’t even get me stated on library books. Also, I’ve never made a handpie!! I really want to make these but I think I will add the cookie dough, nutella AND marshmallows all in the same one. It will be a very large and very tasty handpie. I may need bigger hands. Fantastic idea girl!! Oh my gawd, library books FREAK.ME.OUT. So germy! And they like, NEVER change those plastic covers over the original book cover so they get all grimy and dingy SUPER fast… ugh. I imagine the grossest people with dirty fingers touching the books and ewwww I am shuddering at the thought! Thank god for disinfectant wipes! I still can’t get over how smart and funny your little transitions from rants to recipes are! If I were you, I’d try to get a book deal, success guaranteed! Hahaha, that’s okay, Anita, I forgive you 🙂 a lot of people will agree with Jessie I’m sure (and for that he’s probably jumping for joy lol). Thanks for your comment!! xo. Rina!! I’m so glad you came by 🙂 and I promise one of these days you’ll actually get to sample some of these treats I talk about on here! See you Friday! yum! i love nutella. gonna have to try this! 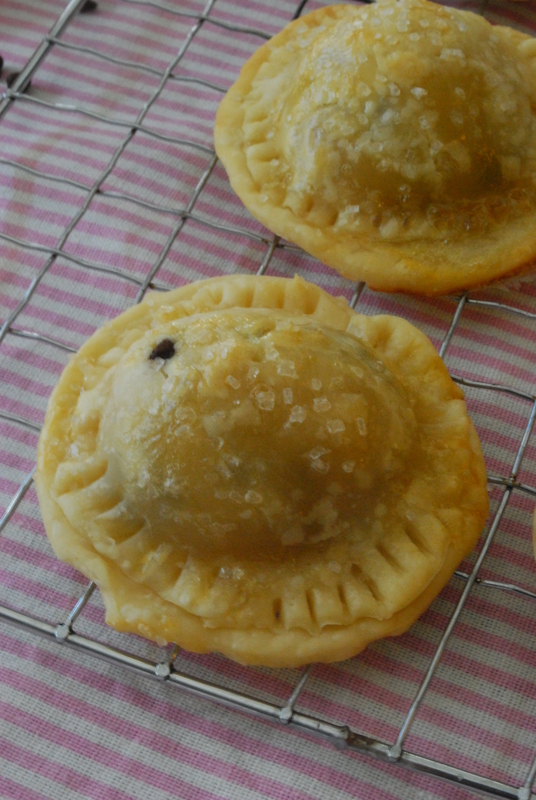 Hand pies have been on my baking list forever! I love that you used nutella and marshmallows…so yummo!!! I am all for shopping at Goodwill and vigorously cleaning said items, but to take a syrup packet from someone else’s trash…eeewwww on so many levels! Yeah, you’re the queen of thrifting but you always find cute stuff and obviously, I’m pretty sure you wash everything, too! Heck, I even wash unused things after I buy them because um, gross? Lol, thanks girl!